Shams-i-Tabrīzī (Persian: شمس تبریزی‎) or Shams al-Din Mohammad (1185–1248) was a Persian Muslim, who is credited as the spiritual instructor of Mewlānā Jalāl ad-Dīn Muhammad Balkhi, also known as Rumi and is referenced with great reverence in Rumi's poetic collection, in particular Diwan-i Shams-i Tabrīzī (The Works of Shams of Tabriz). Tradition holds that Shams taught Rumi in seclusion in Konya for a period of forty days, before fleeing for Damascus. The tomb of Shams-i Tabrīzī was recently nominated to be a UNESCO World Heritage Site. 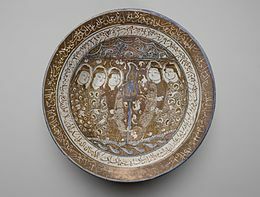 Bowl of Reflections, early 13th century. Brooklyn Museum. According to Sipah Salar, a devotee and intimate friend of Rumi who spent forty days with him, Shams was the son of the Imam Ala al-Din. In a work entitled Manāqib al-‘arifīn (Eulogies of the Gnostics), Aflaki names a certain ‘Ali as the father of Shams-i Tabrīzī and his grandfather as Malikdad. Apparently basing his calculations on Haji Bektash Veli's Maqālāt (Conversations), Aflaki suggests that Shams arrived in Konya at the age of sixty years. However, various scholars have questioned Aflaki’s reliability. Shams received his education in Tabriz and was a disciple of Baba Kamal al-Din Jumdi. Before meeting Rumi, he apparently traveled from place to place weaving baskets and selling girdles for a living. Despite his occupation as a weaver, Shams received the epithet of “the embroiderer” (zarduz) in various biographical accounts including that of the Persian historian Dawlatshah. This however, is not the occupation listed by Haji Bektash Veli in the Maqālat and was rather the epithet given to the Ismaili Imam Shams al-din Muhammad, who worked as an embroiderer while living in anonymity in Tabriz. The transference of the epithet to the biography of Rumi's mentor suggests that this Imam's biography must have been known to Shams-i Tabrīzī's biographers. The specificities of how this transference occurred, however, are not yet known. On 15 November 1244, a man in a black suit from head to toe came to the famous inn of Sugar Merchants of Konya. His name was Shams Tabrizi. He was claiming to be a travelling merchant. As it was said in Haji Bektash Veli's book, "Makalat", he was looking for something which he was going to find in Konya. Eventually he found Rumi riding a horse. A second version of the tale has Shams passing by Rumi who again is reading a book. Rumi regards him as an uneducated stranger. Shams asks Rumi what he is doing, to which Rumi replies, "Something that you do not understand!" At that moment, the books suddenly catch fire and Rumi asks Shams to explain what happened. His reply was, "Something you do not understand." Another version of the first encounter is this: In the marketplace of Konya, amid the cotton stalls, sugar vendors, and vegetable stands, Rumi rode through the street, surrounded by his students. Shams caught hold of the reins of his donkey and rudely challenged the master with two questions. “Who was the greater mystic, Bayazid [a Sufi saint] or Muhammad?” Shams demanded. "What a strange question! Muhammad is greater than all the saints," Rumi replied. "So, why is it then that Muhammad said to God, ‘I didn’t know you as I should have,’ while Bayazid proclaimed, ‘Glory be to me! How exalted is my Glory! [that is, he claimed the station of God himself]?" Rumi explained that Muhammad was the greater of the two, because Bayazid could be filled to capacity by a single experience of divine blessings. He lost himself completely and was filled with God. Muhammad's capacity was unlimited and could never be filled. His desire was endless, and he was always thirsty. With every moment he came closer to God, and then regretted his former distant state. For that reason he said, “I have never known you as I should have.” It is recorded that after this exchange of words, Rumi felt a window open at the top of his head and saw smoke rise to heaven. He cried out, fell to the ground, and lost consciousness for one hour. Shams, upon hearing these answers, realized that he was face to face with the object of his longing, the one he had prayed God to send him. When Rumi awoke, he took Shams's hand, and the two of them returned to Rumi's school together on foot. After several years with Rumi in Konya, Shams left and settled in Khoy. As the years passed, Rumi attributed more and more of his own poetry to Shams as a sign of love for his departed friend and master. In Rumi's poetry Shams becomes a guide of Allah's (Creator) love for mankind; Shams was a sun ("Shams" means "Sun" in Arabic) shining the Light of Sun as guide for the right path dispelling darkness in Rumi's heart, mind, and body on earth. The source of Shams' teachings was the knowledge of Ali ibn Abu Talib, who is also called the father of sufism. According to contemporary Sufi tradition, Shams Tabrizi mysteriously disappeared: some say he was killed by close disciples of Mowlana Jalaluddin Rumi who were jealous of the close relationship between Rumi and Shams, but according to many certain evidences, he left Konya and died in Khoy where he was buried. Sultan Walad, Rumi's son, in his Walad-Nama mathnawi just mentions that Shams mysteriously disappeared from Konya with no more specific details. Shams Tabrizi's tomb in Khoy, beside a tower monument in a memorial park, has been nominated as a World Cultural Heritage Center by UNESCO. A good man complains of no-one; he does not look to faults. Joy is like pure clear water; wherever it flows, wondrous blossoms grow…Sorrow is like a black flood; wherever it flows it wilts the blossoms. An array of mystical poetry, laden with devotional sentiments and strong ‘Alid inclinations, has been attributed to Shams-i Tabrīzī across the Persian Islamic world. Scholars such as Gabrielle van den Berg have sometimes questioned whether these were really authored by Shams-i Tabrīzī. However later scholars have pointed out that it may instead be a question of whether the name Shams-i Tabriz has been used for more than one person. Van den Berg suggests that this identification is the pen name of Rumi. However she acknowledges that, despite the large number of poems attributed to Shams, that comprise the devotional repertoire of the Ismailis of Badakhshan, an overwhelming majority of these cannot be located in any of the existing works of Rumi. Rather, as Virani observes, some of these are located in the "Rose Garden of Shams" (Gulzār-i Shams), authored by Mulukshah, a descendent of the Ismaili Pir Shams, as well as in other works. Murtaz̤avī, pizhūhish va nigārish-i Manūchihr (2004). Zabān-i dīrīn-i Āz̲arbāyijān (Chāp-i 2. ed.). Tihrān: Bunyād-i Mawqūfāt-i Duktur Maḥmūd Afshār. p. 49. ISBN 964-6053-61-0. Jones-Williams, transl. from the French by J. (1968). Pre-Ottoman Turkey : a general survey of the material and spiritual culture and history c. 1071-1330 (1. publ. ed.). London: Sidgwick & Jackson. p. 258. ISBN 9780283352546. He may also have met the great Persian mystic Shams al-Din Tabrizi there, but it was only later that the full influence of this latter was to be exerted on him. Arakelova, Victoria; A. Doostzadeh; S. Lornejad (2012). On the modern politicization of the Persian poet Nezami Ganjavi. Yerevan: Caucasian Centre for Iranian Studies. p. 162. ISBN 978-99930-69-74-4. In a poem from Rumi, the word buri is mentioned from the mouth of Shams Tabrizi by Rumi. Rumi translates the word in standard Persian as biyā (the imperative “come”). This word is also a native word of the Tabrizi Iranian dialect which is mentioned by Persian Sufi, Hafez Karbalaie in his work Rawdat al-Jenān. In the poem of Baba Taher, the word has come down as bura (come) and in the NW Iranian Tati dialects (also called Azari but should not be confused with the Turkish language of the same name) of Azerbaijan, in Harzandi Tati it is biri and in Karingani Tati it is bura (Kiya 1976). Shams Tabrizi was an Iranian Shafi’ite Muslim like the bulk of the Iranian population of Azerbaijan during the pre-Mongol and post-Mongol era. ^  Franklin Lewis, Rumi, Past and Present, East and West, pp. 154–161. ^ "Hazrat Ali -The Father of Sufism". wordpress.com. 19 December 2009. Retrieved 24 July 2017. ^ "Shams Tabrizi". Iran Territory. 22 July 2016. Retrieved 24 August 2018. ^ "Rumi: Mystical Friendship - Humanity Healing Network". Humanity Healing Network. 22 July 2016. Retrieved 24 August 2018. Wikimedia Commons has media related to Tomb of Shams Tabrizi.